Apprenticeships in Scotland have been contracted to deliver the Enterprise Game to Primary and Secondary Schools throughout the county by Fife Council. The purpose of the game is to simulate demand for enterprise amongst young people. 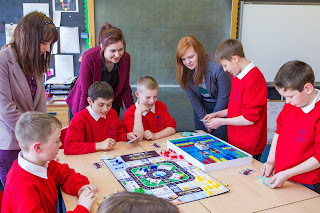 The board game consists of local Fife businesses; this makes the pupils aware of the companies in the Fife economy. The Enterprise game is delivered to pupils aged 11 – 16 (Primary 6+) by our team of Enterprise Apprentices. “I learned how to work and mange a business by building up money to buy more products or businesses and learned how to work as a team. I now understand the term enterprise and will use it throughout life”. As part of the Culture of Enterprise Framework, the Game is helping to change attitudes towards business and entrepreneurship, and helps young people understand the wealth of business and career opportunities available to them in future years. If you would like to know more about the work we do in schools, contact the team today on 01334 844 900.